user warning: Expression #6 of SELECT list is not in GROUP BY clause and contains nonaggregated column 'hotkilns_live.nodequeue_nodes_node.position' which is not functionally dependent on columns in GROUP BY clause; this is incompatible with sql_mode=only_full_group_by query: SELECT DISTINCT(node.nid) AS nid, node.title AS node_title, node_data_field_videos_category.field_videos_category_value AS node_data_field_videos_category_field_videos_category_value, node.type AS node_type, node.vid AS node_vid, nodequeue_nodes_node.position AS nodequeue_nodes_node_position, term_data.name AS term_data_name FROM node node LEFT JOIN nodequeue_nodes nodequeue_nodes_node ON node.nid = nodequeue_nodes_node.nid AND nodequeue_nodes_node.qid = 11 INNER JOIN search_node_links search_node_links_to ON node.nid = search_node_links_to.sid LEFT JOIN content_type_videos node_data_field_videos_category ON node.vid = node_data_field_videos_category.vid LEFT JOIN term_node term_node ON node.vid = term_node.vid LEFT JOIN term_data term_data ON term_node.tid = term_data.tid INNER JOIN node_access na ON na.nid = node.nid WHERE (na.grant_view >= 1 AND ((na.gid = 0 AND na.realm = 'all') OR (na.gid = 0 AND na.realm = 'content_access_author') OR (na.gid = 1 AND na.realm = 'content_access_rid'))) AND ( (node.status = 1) AND (node.type in ('videos')) AND (search_node_links_to.nid = 426 ) )GROUP BY nid ORDER BY nodequeue_nodes_node_position ASC, term_data_name ASC in /home/hotkilns/public_html/sites/all/modules/views/includes/view.inc on line 814.
user warning: Expression #6 of SELECT list is not in GROUP BY clause and contains nonaggregated column 'hotkilns_live.nodequeue_nodes_node.position' which is not functionally dependent on columns in GROUP BY clause; this is incompatible with sql_mode=only_full_group_by query: SELECT DISTINCT(node.nid) AS nid, node.type AS node_type, node.vid AS node_vid, node.title AS node_title, node_data_field_pdfs_category.field_pdfs_category_value AS node_data_field_pdfs_category_field_pdfs_category_value, nodequeue_nodes_node.position AS nodequeue_nodes_node_position FROM node node LEFT JOIN nodequeue_nodes nodequeue_nodes_node ON node.nid = nodequeue_nodes_node.nid INNER JOIN content_type_pdfs node_data_field_pdfs_international ON node.vid = node_data_field_pdfs_international.vid INNER JOIN search_node_links search_node_links_to ON node.nid = search_node_links_to.sid LEFT JOIN content_type_pdfs node_data_field_pdfs_category ON node.vid = node_data_field_pdfs_category.vid INNER JOIN node_access na ON na.nid = node.nid WHERE (na.grant_view >= 1 AND ((na.gid = 0 AND na.realm = 'all') OR (na.gid = 0 AND na.realm = 'content_access_author') OR (na.gid = 1 AND na.realm = 'content_access_rid'))) AND ( (node.status = 1) AND (node.type in ('pdfs')) AND (node_data_field_pdfs_international.field_pdfs_international_value = 1) AND (search_node_links_to.nid = 426 ) )GROUP BY nid ORDER BY node_data_field_pdfs_category_field_pdfs_category_value ASC, nodequeue_nodes_node_position ASC, node_title ASC in /home/hotkilns/public_html/sites/all/modules/views/includes/view.inc on line 814. DaVinci Bell-Lift kilns can be loaded from all four sides. The temperature uniformity is unsurpassed. They are available on the X3200 Series (30-1/2 square) and T3400 series (30-1/2" x 43-1/2 rectangular). 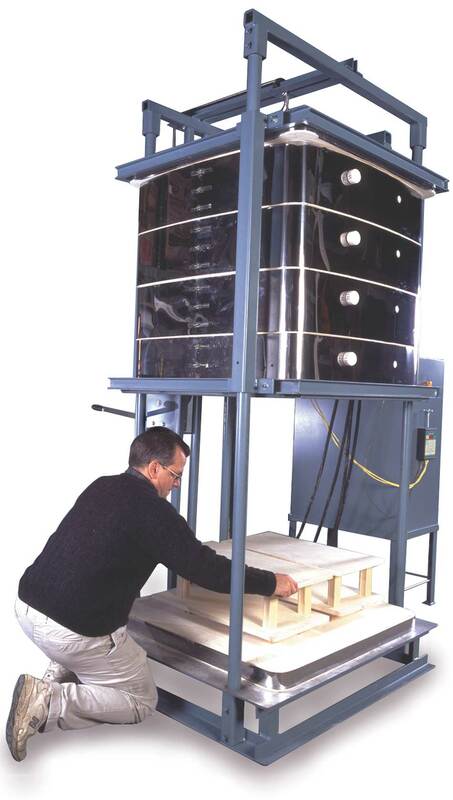 The kiln sections and top are held together as one unit with a metal support frame. This unit is lifted up with a ratcheted hand winch mounted on the external frame. There are manual safety pins that lock the kiln in place when the kiln is fully raised. The support frame is made from heavy duty welded parts that are easily assembled on site so that the system can be easily broken down for shipping. An 18", 27" or 36" high kiln (interior) will be 105" high, and a 45" high kiln will be 123" high. See the T3400 and TB3400 Series and X3200 and XB3200 series on the DaVinci Square/Rectangular Kiln Series page for all the models that can be ordered with the Bell-Lift System. Powered bottoms can also be used. The price of this option is $4995 added to any of the base prices of the available DaVinci models.